Dan Fernandes of Mt. 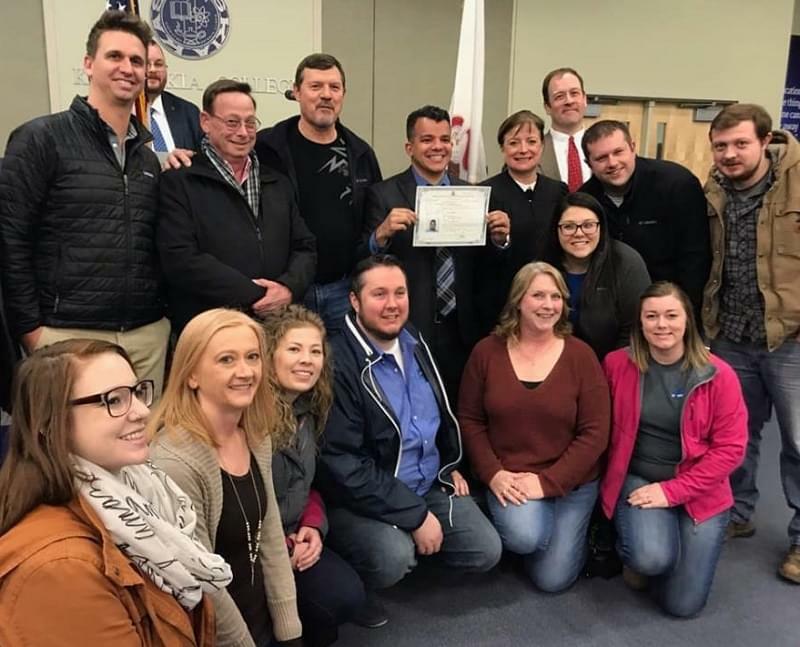 Vernon surrounded by his fellow employees and friends from Bettendorf Stanford in Salem after receiving his U.S. Citizenship. 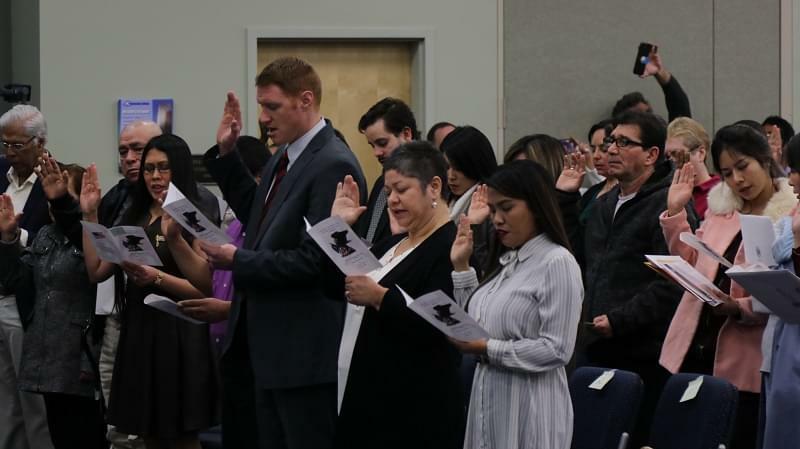 There are 67 new citizens in the U.S., including a Mt. 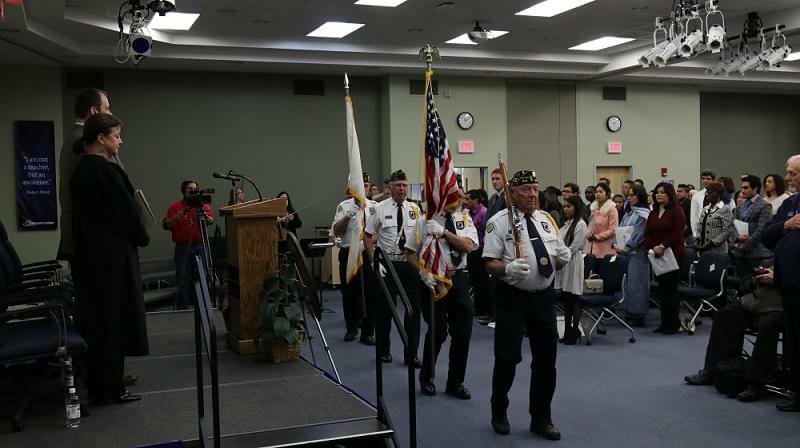 Vernon man, following a Naturalization Ceremony at Kaskaskia College on Friday. U.S. Attorney Steven Weinhoeft presented the candidates. Federal Judge Nancy Rosenstengel then administered the oath. Kaskaskia College President George Evans then spoke to the new citizens. Among those taking the oath was Daniel Fernandes who is an employee of Bettendorf Stanford in Salem. Fernandes says the U.S. is now home. Fernandes joined the team after another employee who had worked with him in California recommended him. He is a lead assembler for the slicers used for buns. A number of employees at the Salem plant were in attendance at the Lifelong Learning Center at the main college campus to watch their friend and fellow worker become a U.S. Citizen. 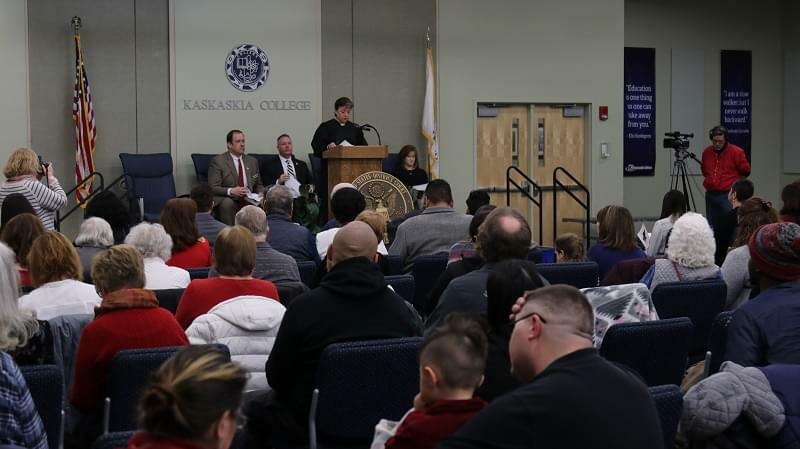 Judge Nancy Rosenstengel talks to soon to be citizens and their family and friends at the Kaskaskia College ceremony on Friday. Photos by Pat Hodges. Candidates for Citizenship take the oath of office from Judge Nancy Rosenstengel. Photo by Pat Hodges. Beckemeyer American Legion provides Color Guard. Photo by Pat Hodges.